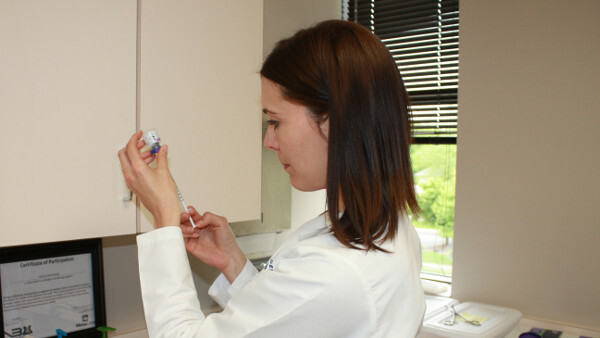 At Hancock Dermatology our dermatologist offer private and personalized treatment options to improve your appearance. They use innovative therapies for facial and skin rejuvenation to address a wide range of cosmetic concerns. Our board certified dermatologists treat common and rare conditions that affect the appearance of your skin. Before they recommend any treatment, our doctors take a detailed medical history and find out your skin sensitivities and treatment goals. Botulinum toxin (BOTOX) injections are given to reduce skin creases and wrinkles that arise from squinting and frowning. It does this by reducing the ability of specific muscles of the face to contract which reduces facial expression lines and wrinkles. BOTOX blocks the impulses from the nerves that signal the muscles to contract. This non-invasive procedure does not require anesthesia and it can take a mere 15 minutes. The improvements that develop after BOTOX injections last for 3 to 6 months. Consequently, repeated injections are required to maintain its effects. Hyperhidrosis or excessive sweating of the armputs, palms, or other parts of the body. Kybella is a new treatment approved for unwanted neck fat. It is a simple in-office, non-invasive procedure that requires minimal downtime and discomfort. This treatment requires only small injections and no incisions are required. Fillers are substances which are injected into the skin to reduce the appearance of hollows, folds and wrinkles. The filler products used by Dr. Sanford contain a local anesthetic to help ease the discomfort assocaited with the injection. After the treatment, you can resume your normal activities after a few hours though there may be some discomfort at the injection site and a little redness, pain, swelling and/or brusing. These usually resolve after a few days. There are many fillers available. Our dermatologist can help you make the best choice for your condition and skin type as well as based on where filler works best and how long it lasts. Chemical peels are are applied on the skin to remove the top layer of the skin which consists of dead skin cells. They are used to rejuvenate the skin since they make it appear smoother and healthier by reducing the signs of aging and sun damage. There are many types of peels available like glycolic acid, lactic acid, salicylic acid, enzyme, amino acid, TCA, DCA and Jessner’s peels. These are usually divided into superficial peels like glycolic acid which is used for more mild conditions including early sun damage. Glycolic acid peel is applied to the skin for a brief period before it is neutralized. For optimum results a series of peels are required. The Jessner’s peel is another superficial peel which is a good option for people with pigment irregularities. Persons with more severe sun damage or deep scars often require stronger peels like the medium depth peels. Dr Sanford uses TCA peels of various strengths as her preferred peel. Risks of a deeper peel include the risk of developing skin infection, scarring and changes in pigmentation. They also take longer to recover – about 7 to 10 days. Our doctor will evaluate your skin and create a customized treatment plan that takes into consideration your condition and treatment goals. Reduce effects of sun exposure, weather and aging. Dr. Sanford is well trained in the use of lasers for the treatment of a wide range of conditions. She can discuss an individualized treatment plans to suit your needs and to help you achieve your individual goals. Hancock Dermatology will offer laser services in the near future. Sclerotherapy is a procedure which involves the injection of a solution into the veins to make them collapse and fade. Dr. Sanford uses a product called Asclera. This foam is injected into small veins over 30-45 minutes. Compression stockings must be worn after the procedure and 2 treatments are often required. Collagen P.I.N. (Percutaneous Induction Needling, also referred to as PCIT, Percutaneous Collagen Induction Therapy… a.k.a. micro-needling) is a method of introducing a controlled wound into the skin triggering a release of growth factors, new collagen & elastin. This process causes much less damage to the epidermis than dermal rolling or lasers and other ablative treatments, which helps to protect the new skin cell growth, providing for quicker healing and a much higher success rate. Directly after your treatment we recommend no make up for 24 hours and then using only mineral based foundation, as it cannot build bacteria. You may go back to your regular foundation 4 days post treatment. In addition to performing procedures to improve your appearance, our skin specialists can also tell you how you can maintain healthy and youthful-looking skin. Dr Sanford’s preferred skin care regimen includes the use of sunscreen to prevent photoaging. This sunscreen should be broad spectrum which means it offers protection against both UV/UVB rays and have a SPF of 30 or more. Sunscreen should also be applied on the neck, upper chest and hands since they are also exposed to UV damage and they tend to age faster. A topical retinol product should be used nightly to help reduce the appearance of fine lines and wrinkles, promote collagen production, and chemically exfoliate the skin. Occasionally, mild peeling or irritation can occur with retinol products. Reducing the frequency of application or adding a heavy moisturizer often resolves these symptoms. A physical exfoliant is also an important part of your skin care regimen. A scrub or facial brush can be used about once weekly.